TIME IS TICKING away for those wishing to amend their CAO applications, as the change-of-mind deadline approaches tomorrow. Ahead of the deadline, the CAO is warning people to think carefully about introducing new courses or changing their order of preference at this stage in the application process. 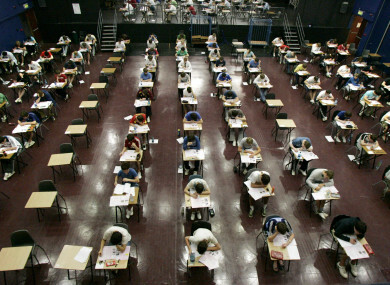 “Every year we experience a surge in last-minute amendments to CAO applications. This is due to a number of factors, for example. more time spent researching courses and the introduction of new areas of interest,” CAO communications officer Eileen Keleghan said. In 2017, 54% of applicants availed of the change-of-mind facility at least once. She advised applicants to always remember to place their course choices in genuine order of preference. “What we would like to advise applicants to avoid doing is making changes to their order of preference or course choices based on how they feel they have performed in their examinations,” she said. “If applicants simply follow the golden rule of placing all of their courses in their genuine order of preference, they will be offered the course highest up on their preference list that they are deemed entitled to if any,” she said. Make sure to carefully check your application and ensure that all of the course codes are correct and listed in order of preference before 1 July at 5.15pm. When entering new courses or editing course choices, applicants must list all courses on the New Choices list. After making changes to an application, applicants will receive an email. Applicants should read this email carefully to ensure that there are no errors or omissions. Round One CAO offers will be available to view online on Monday 20 August from 6am. Applicants will have until 5.15pm on 24 August to register an acceptance. Applicants who do not receive an offer in Round One will receive a Statement of Application Record which they must carefully check and notify CAO of any errors or omissions. The expected date for Round Two offers is 29 August. Round A offers for mature applicants, mature nursing applicants, deferred applicants and those who have completed an Access course will be available online from 6am on Thursday 5 July. Email “Time is ticking - The CAO change-of-mind deadline is tomorrow”. Feedback on “Time is ticking - The CAO change-of-mind deadline is tomorrow”.